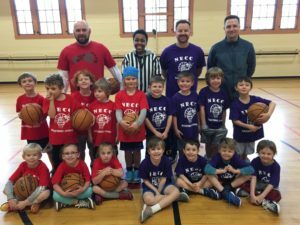 Youth Sports Leagues at the NECC are a fun and positive experience designed to lead to your child’s lasting participation in sports and physical activity. We challenge ALL our parents and spectators to help the NECC maintain a supportive framework while your child learns new physical and social skills. All recreational skill levels are encouraged to sign up, and we guarantee playing time for everyone. Each team will have a one-hour practice where the athletes will have the opportunity to learn and solidify the fundamentals of the game, and then show their skills in a weekly game. One practice a week, and one game a week! League is designed to enhance self-esteem and build teamwork skills while providing equal playing time. AGES: 5-6, 7-8, 9-11 year old leagues. AGES: 5-6, 7-8 year old leagues. One practice a week, and one Saturday (sometimes 2!) game(s) a week. League is designed to enhance self-esteem and build teamwork skills while providing equal playing time and having fun. For players ages 8-10, please see our spring Volleyball skills class. TIME: Practice scheduled 1x/week between 5-8pm; Games on weekends.